The Perspective of Life From My Side of Window: SELAMAT HARI RAYA!!! Hari Raya has come again. A day that is waited by Muslims around the world after a full month of going through pain and sacrifices of fasting. I just came back from Raub, Pahang (my maternal grandma's kampung). 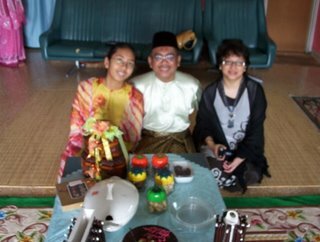 Usually we will celebrate the morning of Raya at KL first than only we go back to Pahang but this year, my mum decided that she wants to spend more time before Raya with my grandma. With all the ever-tasty food, (lemang, rendang, ketupat and the list goes on) my stomach is bloated 'cause I ate too much of everything. But I guess it's Raya, so I should be able to compromise once in awhile. During Hari Raya, we will get 'duit raya' or at least kids will get it. Sadly, as each year comes by, the amount of 'duit raya' I receive are declining. Why? 'Cause I'm getting older! The day will come when I will have to give the kids money instead of receiving it. Selamat Hari Raya to all my Muslim friends and Happy Deepavali to all my Indian friends. I look forward to getting a fat ang pow from you, gal.Remember, no less than RM500/= OK? Ha ha.